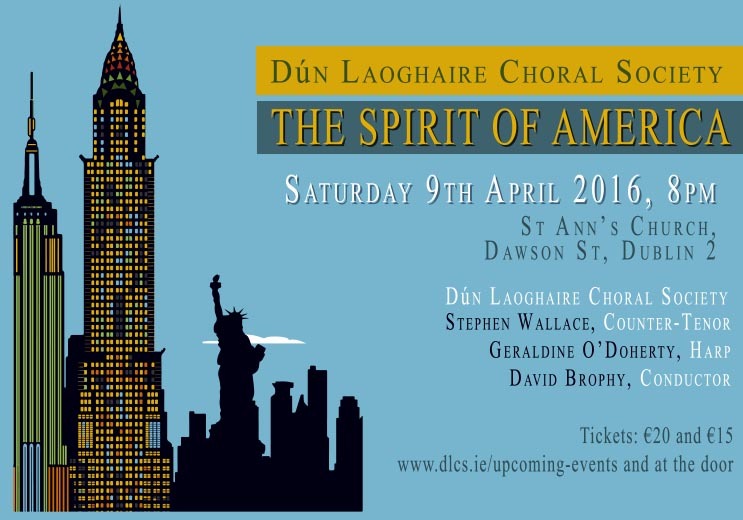 A programme of all-American music in our favourite city-centre performance venue that is St Ann's Church, Dawson St. The choir will sing works by Leonard Bernstein, including his Missa Brevis which was Bernstein's final completed choral work before his death in 1989. We will also perform his famous Chichester Psalms, commissioned in 1965 and which is sung in Hebrew and is very West Side Story-esque in parts! We will also sing works by Samuel Barber, Randall Thompson and Aaron Copland. We will be accompanied by the outstanding Stephen Wallace, one of Europe's leading counter-tenors and RTE Concert Orchestra Principal Harpist Geraldine O'Doherty.